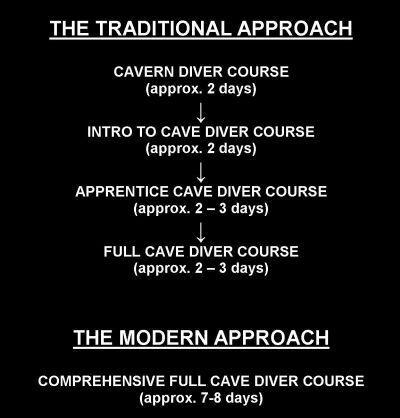 PSAI offers their divers a choice of a modified “Traditional Approach” or “The Modern Approach” in the progression of PSAI Cave Diving certification. The major premise of the Modern Approach is to give the diver all the information, tools, skills and in water training experience, in order that when they are in the cave environment, they have a “full tool box” to deal with it and gain further experience as they continue to dive. Cave Diving Training & the Part of PSAI in the History of Cave Diving. An Overview of the History of Cave Diving. Mastering Buoyancy for Cave Diving. The Use of Nitrox for Cave Diving. Handling Emergencies in the Cave Environment. Protecting the Fragile Cave Environment. The PSAI Intro to Cave Diver course is designed for those divers who wish to make limited penetrations into the cave environment where vertical access is not possible. This includes a variety of underwater cave zones found throughout the world in both fresh and salt water environments. This course takes the diver beyond the “daylight zone” of the cavern overhead environment. The course instructs the diver in basic cave diving skills. The maximum depth of this course shall be limited to 40m (130 feet). The dives are conducted within the no-stop dive table or dive computer limits (staged decompression is not allowed). The course provides the diver with knowledge and basic skills for limited penetrations in the cave environment using single cylinders. The Rule of Third’s shall apply as the minimum for gas management. If the candidate is using doubles then the 1/6 gas management rule is the minimum. The Intro to Cave Diver course is limited to main line penetration only – no jumps, gaps, traverses or circuits are allowed. The Professional Scuba Association International’s (PSAI) Apprentice Cave Diver course is designed for those divers who wish to enter the cave environment where vertical access is not possible. This includes a variety of underwater cave zones found throughout the world in both fresh and salt water environments. This course takes the diver beyond the “daylight zone” of the cavern overhead environment. The maximum depth of this course shall be limited to 40m (130 feet). Visibility must be at least 6 meters (20 feet).The Rule of Third’s shall apply as the minimum for gas management. Decompression for this course shall be limited to a single stop on one (1) deco mix. Stage cylinders to extend the range of penetration are prohibited. Simple jumps and gaps are permitted. Once certified, the Apprentice Cave Diver is not allowed to do traverses or circuits unless under the direct supervision of a PSAI Full Cave Instructor. 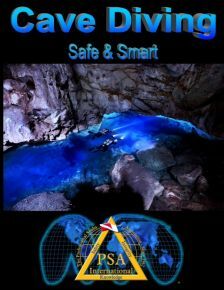 The Professional Scuba Association International’s (PSAI) Full Cave Diver course is designed for those divers who wish to enter the cave environment where vertical access is not possible. This includes a variety of underwater cave zones found throughout the world in both fresh and salt water environments. This course takes the diver beyond the “daylight zone” of the cavern overhead environment. The maximum depth of this course shall be limited to 40m (130 feet). Visibility must be at least 6 meters (20 feet). The Rule of Third’s shall apply as the minimum for gas management.